This low-growing patch-forming perennial is almost always found on stream-sides or other damp, often shady, places. The spikes or unscented pale pink flowers appear before the leaves, sometimes as early as February, the growth at first looking like button mushrooms. Mabey describes the spikes as resembling dwarf pink conifers. The large leaves, heart-shaped and toothed, grow to as much as a metre across. They account for butterbur’s other popular name, wild rhubarb, but their stems are hollow and presumably not worth eating! The name butterbur, however, reflects the use to which the leaves were put in earlier days, to wrap butter, before the days of refrigeration. They are soft and pliable, and the grey down on the underside is cool to the touch. They can also serve a useful purpose as emergency headgear (‘petasites’ comes from a Greek word describing a kind of wide-brimmed cap), to protect from the sun or even the rain. 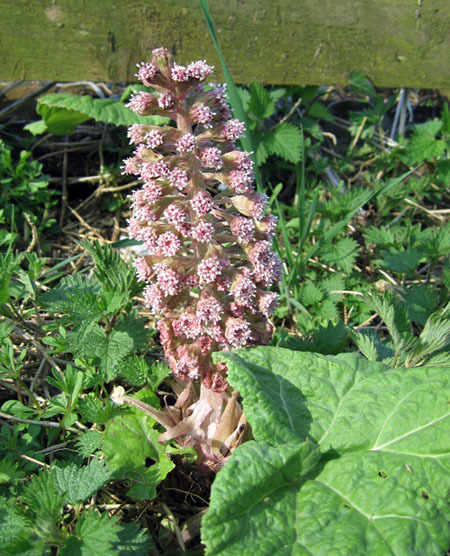 In Sulgrave parish, butterbur may be found in the Pocket Park, in Stockwell Lane and elsewhere. Text: George Metcalfe. Photograph: Colin Wootton. This entry was posted on Friday, April 16th, 2010 at 9:26 pm	and is filed under News. You can follow any responses to this entry through the RSS 2.0 feed. You can leave a response, or trackback from your own site.